Capable of smearing more butter in a day than the cinnamon roll joint in the food court can do in a year, the Bataleon Fun.Kink Snowboard is pure fun. It's a medium-flexing twin with a spooned-out tip'n'tail that demand flatground funk. Even the most serious among us can't help but throw some surprise 180s on the Fun.Kink, they're impossible to avoid! With mellow camber, a fast base, and good pop, this is a board that takes the park with it, revealing cat track side hits where you never thought to look. If you're one to milk the most out of every last minute on the hill, this is a board for you. TWIN 3BT™  3rd generation TWIN 3BT™ has the added benefit of Sidekick. The base uplift angle is mellow, becoming more dramatic at the widest areas of the board. It offers a loose jib feel while the wide centerbase makes it stable on takeoffs, landings, in presses and at high speeds. Designed for terrain parks and overall freestyle riding. 99% Twin  Keeping true twin beneath the contact points with a longer nose and shorter tail. 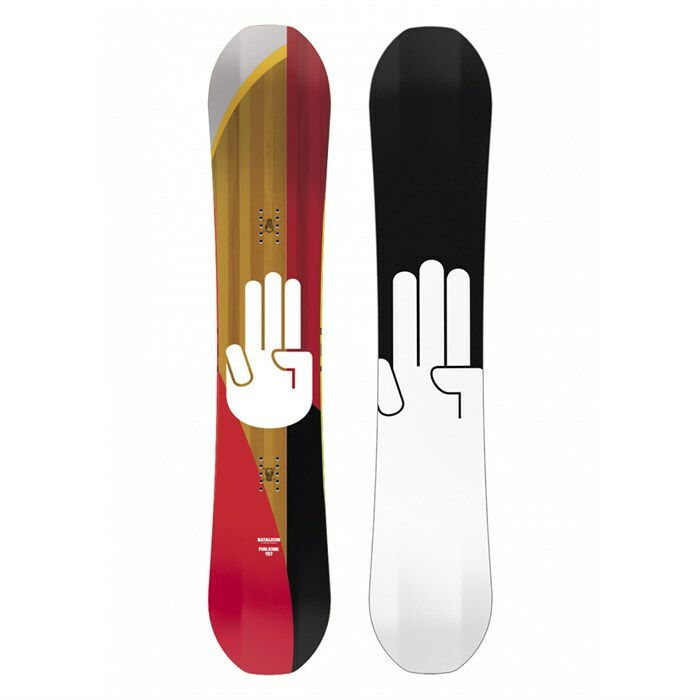 This shape produces a twin feel with increased performance in powder, great for all-mountain slayers. SideKick  SideKick dramatically increases the sidebase uplift just outside the widest points of the nose and tail. This makes turn initiation smoother, increases float in powder and improves handling of the board in rough terrain. Light Core  Bataleon's 50-50 Swiss paulownia and poplar woods blend for optimal strength to weight properties. Dual Super Tubes  Two hollow carbon rods milled into the bottom of the core to enhance pop and give the camber more snap. Biax Laminate  Traditional and time tested two-way weave of fiberglass is light, strong, and responsive keeping the board snappy without adding torsional stiffness. ABS Solid Walls  Tried and trusted ABS sidewalls for the best flex to strength ratio. Flip Flop Base  Boards with Flip Flop bases have two or more base color variations. Bataleon uses this process to reduce waste. Super Slick X  Not a basic extruded base. It has the highest molecular content available for an extruded base. That means it's super slick, durable and maintenance-free.